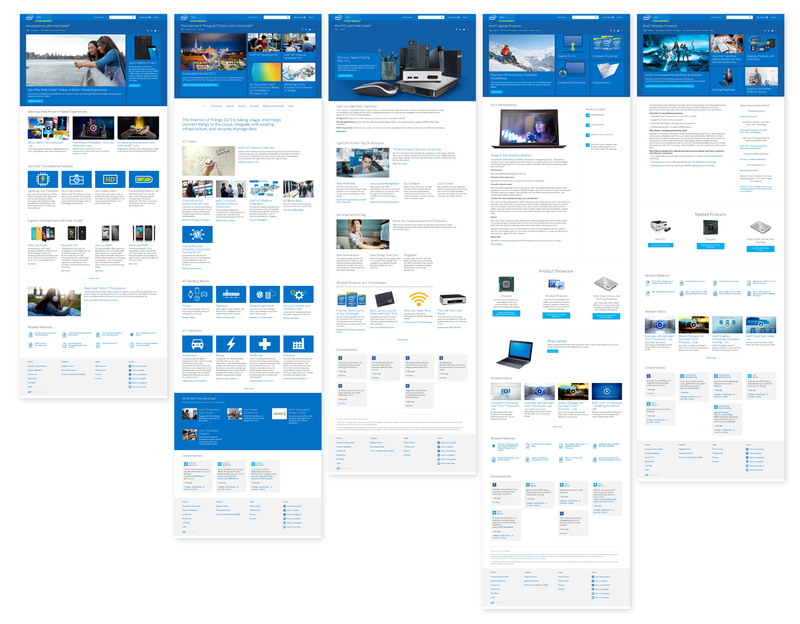 Improve the experience of both visitors and content creators by redesigning the platform for the Intel.com property. Description Improve the experience of both visitors and content creators by redesigning the platform for the Intel.com property. Making the whole platform responsive, simplifying presentation and maintenance for all touchpoints. Improving the user experience by creating Storytelling boilerplates for content owners to start from, thus improving the likes of better content presentation. Eliminating pain points for Intel content providers by simplifying the content management platform from 47 modules to 9 to choose from when adding content. 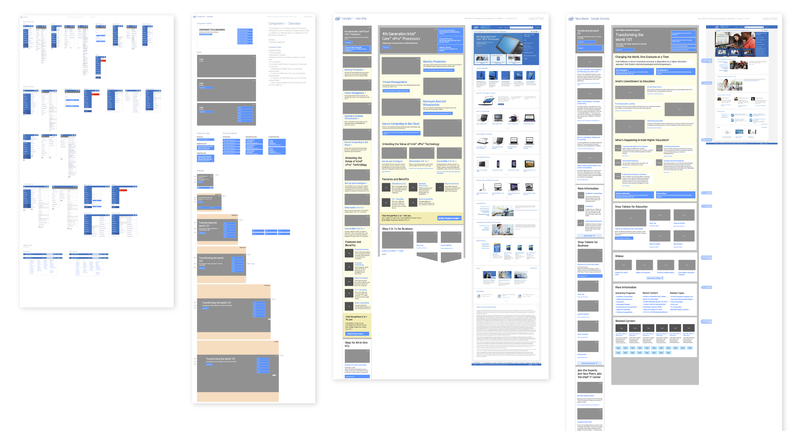 Most of the wireframes presented here were only a visual reference from where to start the real design process, which happened in real code. We made all design decisions directly on an online prototype. We also used this prototype to present to the client, who tested it on 27 different devices in their test lab, ranging from iPhones to touchscreen-enabled ultrabooks, to ultrawide-screen monitors. By visually presenting the current ecosystem of screen sizes, we made the client aware why responsive design is more than breakpoints. This gave us space where to present a more solid proposal that solved for all device screens and scenarios. Creating high-level personas from their existing ones and envisioning some possible scenarios we helped the client understand how the same person might arrive to information from different points and through many devices. This helped us convey the need to present each page as a landing page, and promote a better storytelling framework as a solution to come from our work to the client’s problem of organising content. After a thorough analysis of the current site structure and content, we realise the existing content modules could be reduced to only four “archetypes”. After auditing exisiting content against those four archetypical modules grew into nine (9) final modules. With those 9 modules and the customer journeys we created a “language”: a storytelling framework that would help content owners create better and more understandable landing pages with their existing content. We then created examples of those storytelling templates, which worked responsively, showing the client how the existing content could be better organised in an easy way with the proposed final modules. The whole design process happened on an html/css prototype where we tested and refined our ideas. All through the process we presented our findings and results as a fully functioning responsive prototype that could be evaluated in any device at any point. Currently Intel enjoys our solution that helps them create innumerable pages and organise a huge amount of content in better, more compelling ways for their users.